The Eco-Keeper Bed Bug Tent is the best bed bug protection; an immediate solution to any irritating insect infestations. This highly innovative technology has customizable special features developed by our experienced pest control operators. 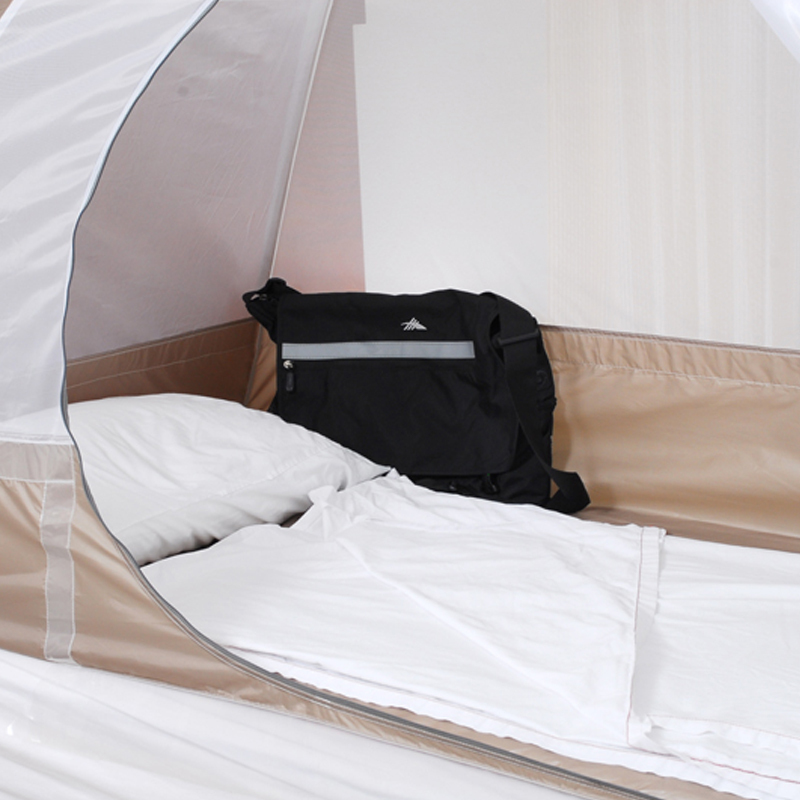 The Eco-Keeper Bed Bug Tent will provide you with full protection during your night's sleep. It is a perfect remedy and immediate control over bed bug bites. 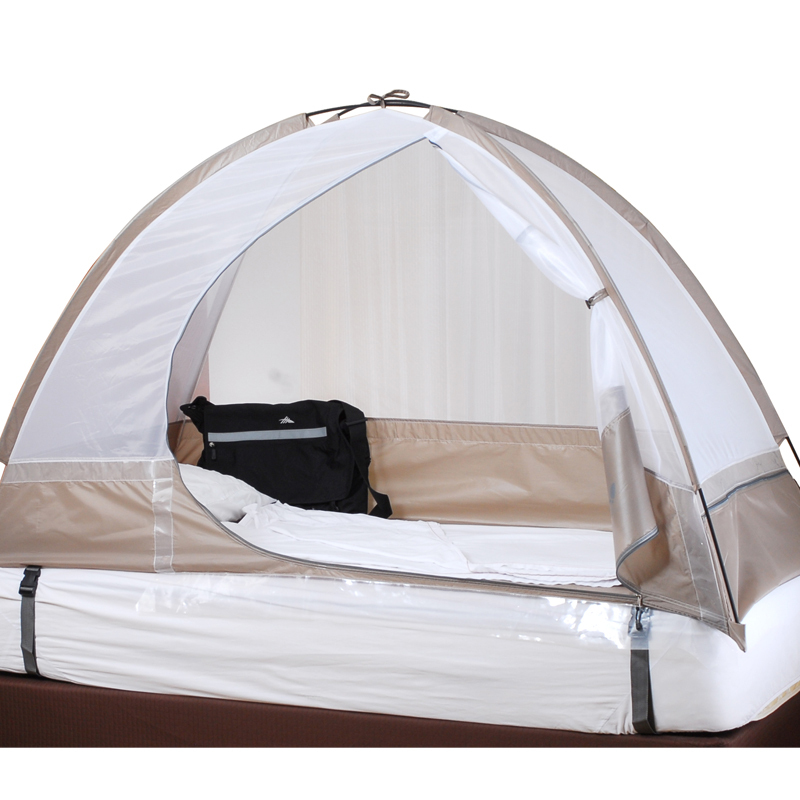 This tent can be used practically in all locations and can be sold even to the areas where bed bug products are prohibited (such as New York, California, and other states). People are resting well thanks to the Eco-Keeper Bed Bug Tent. TEST product - Please don't buy this item. Dorm: Attach the straw to the nozzle. Spray thoroughly around all 4 corners of the mattress focusing on all seams- repeat same procedure on box spring. Repeat treatment twice a week for the first two weeks. Following the first two weeks, Bedlam should be applied only once a week until infestation has been fully eradicated. One Bedroom: Refer to Dorm Treatment Procedures in addition to a thorough treatment with bedlam along the baseboard area. Using the straw is highly recommended for thorough treatment along all cracks and crevices. Spray in any additional areas where infestation may be present. The Eco-Keeper Bed Bug Tent is the most immediate solution to any irritating insect infestations in the sleeping area. This highly innovative technology with its customizable features were developed by our experienced pest control operators to provide you with full protection during your sleep. It is the perfect remedy against bed bug bites. Avoid the inconvenience of having to sleep outside the comfort of your own home. No more worrying about discomforting your family or friends, or spending unnecessarily high costs on renting out a room at a hotel as a means of temporarily escaping from the irritating bites during your time of rest. Target Pest(s): flying and crawling insects such as bed bugs, mosquitoes, and no see ums. Immediate Relief: provides immediate relief from bed bug bites. 360 degrees of protection: Whether they crawl from the bottom of the bed or they crawl on the wall to the top and drop down on the bed, the tent will provide protection from all sides. Even the fine mesh cannot be penetrated by the bed bugs and the slippery vinyl wraps the bottom of the tent so that they cannot crawl to the top. 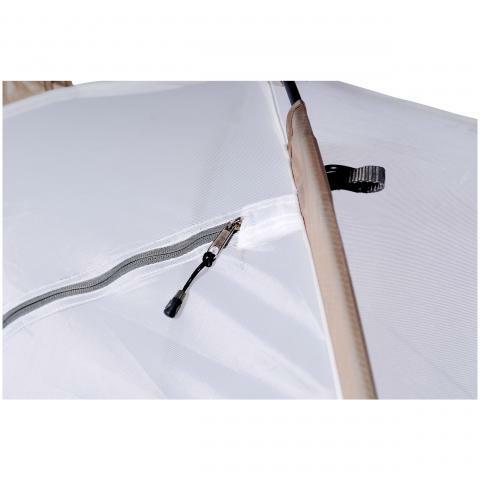 Bed Bug Climb Proof Skirt: the plastic veil features a non grip surface which prevents bugs from being able to climb up the side of the tent. Proven Effective: University tested and has been proven to be effective from a multitude of pests including bed bugs, flies, fleas, mosquitoes, and many more. Ergonomic Design: the design of the tent is made so that it is highly breathable. Moreover, the tent has excellent air flow and so it will not block the cool breeze of fans or the warm air from heating devices which provides comfort as well as protection. Zip Up Travel Bag: comes with an easy to carry zippered bag so this is a great product to use during travelling when you are the most vulnerable to bed bugs. Bring it to hotels, inns, overseas, to the dorm, on business trips, family vacations, and much, much more. Straps: the straps of the tent are designed with a traction device so that it will provide stability of the tent to the mattress. 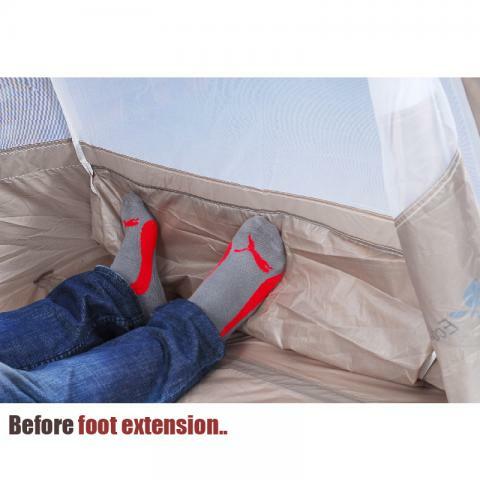 Foot Extension:An optional feature on each tent given for the user to extend out foot room inside the tent for extra comfort. Zipper Pocket: securely holds the zipper in place to avoid risk of possible openings for bed bugs to enter inside tent. Lightweight: conveniently easy to use and totally lightweight for easy installation. Double Zipper: easy entry and exit to and from the inside of the end. Broad Spectrum: not limited to just a bed bug infestation but can be used to protect you from such pests like fleas, ticks, flies, mosquitoes, moths, spiders, and many, many more. Net Visibility: fine mesh of net does not interrupt visibility so you do not need to be discomforted from doing leisurely activities such as watching the television. Professional Grade: Quality professional grade tent that even professional bed bug control companies are using now. All around protection: the fine mesh that is used to make this tent even protects from bed bugs that will crawl on the ceiling and drop down onto the bed. The fine meshing that is used for the tent is even smaller than 400 holes per sq inch (standard No-see-um mesh size) at more than 600 holes per sq inch. 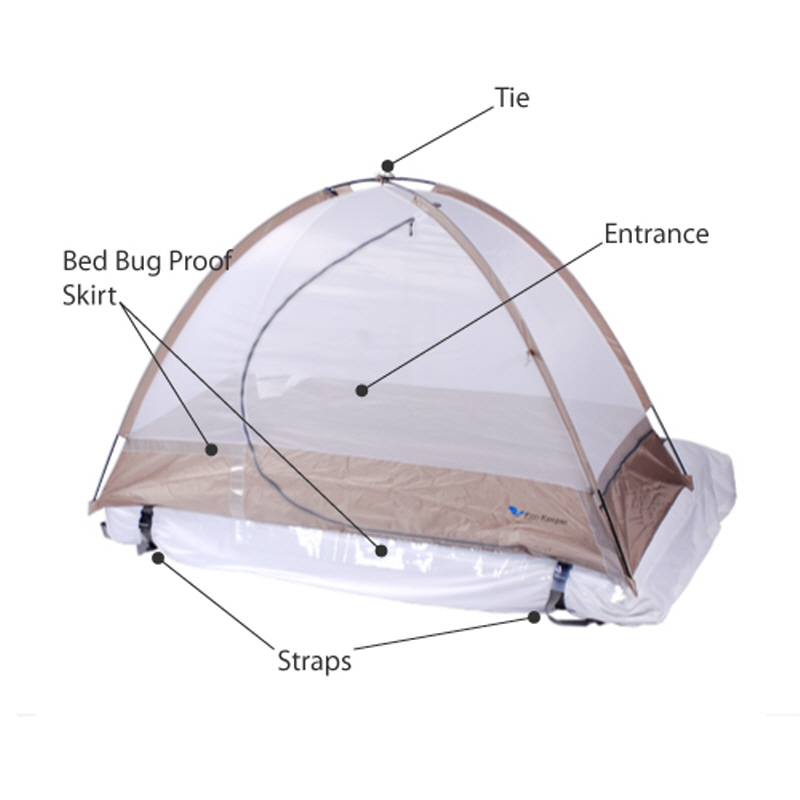 Therefore, this tent provides almost a protective bubble on all sides so that bed bugs cannot penetrate or pass from any side whether it is from the bottom or even from the top. Disclaimer: The Eco Keeper Bed Bug Tent has been university tested to be proven as a bed bug proof apparatus for the prevention of bed bug bites, but it will not kill actual bed bugs nor will it prevent a new bed bug infestation. 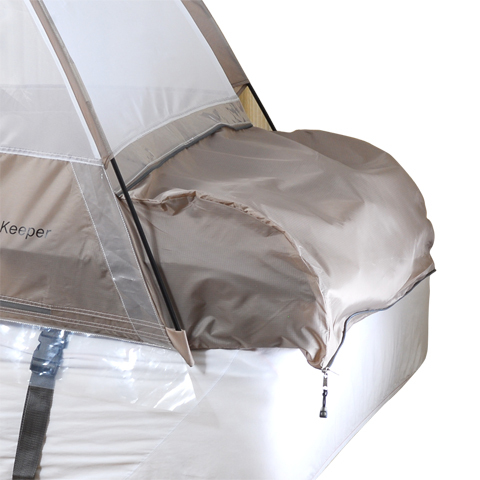 Eco-Keeper is not reliable for bed bugs that are carried inside the tent by the end user. User is responsible to thoroughly inspect ones' self, their surroundings, their pets, and all other items entering the tent. However, if the tent is used in conjunction with the correct chemical treatment approach, it will prove to provide the most optimal results in eliminating your bed bug infestation. Call 1-800-788-4142 for more information on bed bug control. Preventing Bed Bugs While Traveling. This thing performs EXACTLY as promised. I have rarely been this pleased with a product in terms of meeting or exceeding the claims made by the advertiser as well as getting what I paid for. I am not personally concerned with a bed bug problem - I moved to phoenix and because of a bad back have to sleep on the floor. Not wanting to be attractive to scorpions I got this little baby for protection and now I would use it to defend against any type of critter. Very good product. OH, and it's not clostrophobic inside! There's plenty of room to sit up and to breath. And you can see out of it to watch tv, etc. Get you one! ;) PS, I plan to take it to hotels for travel as well since hearing about the growing bed bug problem for travelers. This thing wads up into the tiniest little carrying case. Amazing. I have few bed bugs lurking around the house and they always find me for their bloody dinner. NO BITES SINCE USING IT. It does work as a trap because the little vampires are sometimes waiting on the mesh in hope of an opening. You can kill 'em on the spot. Thanks to this I can sleep with confidence. If you are purchasing for noseeum protection, this tent will not work. 400 holes per sq. inch just isn't enough.For all other bugs-great tent and PESTMALL's quick service is great too. If you want to get bite free sleep , get this!!! It works!! Just follow directions and make sure you get in naked and leave clean clothes inside.. I bought a queen size tent for my kids to play in outside in the back yard. Great for protection against mosquitoes and other annoying bugs. Bed bugs cannot penetrate the mesh, nor can they leg their small hatchlings inside the mesh, so you can rest assured that you won't get any big moments, only thing is you have to disrobe and wisk down with a handled brush and then jump in with no clothes on or they will always ride in with you on your clothes. Just put your pajamas inside the bed bug tent and put them on once you've zipped up. Mornings are funny, you see them on the mesh and then you flick them off and unzipper quickly and get out, then you pick them up and down the drain. We prefer this to pesticides and sure enough when you don't offer yourself as food at night the majority will leave under the door to find a new victim. 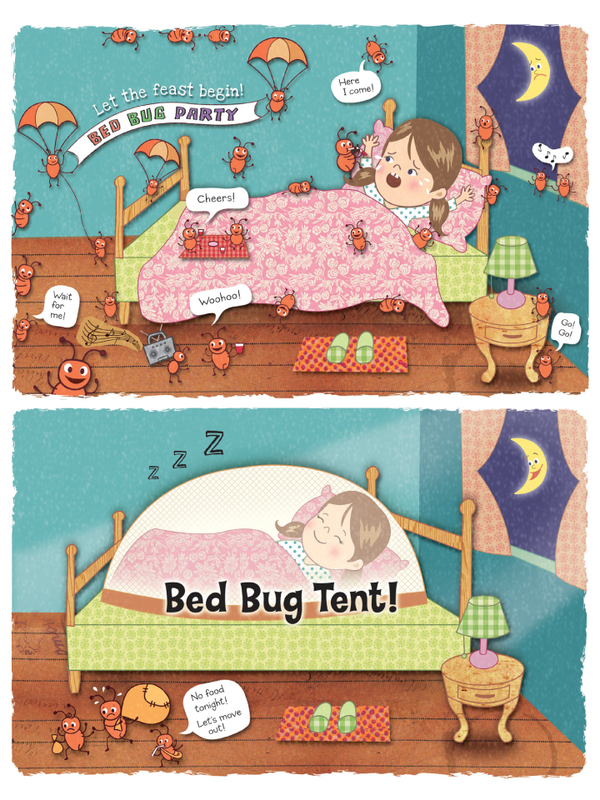 Three cheers for bed bug tent from Eco! We've gotten exterminators etc, but we were getting bitten nightly (our apartment building is apparently infested) . We started sleeping inside the tent, and have not gotten one bite since. It would be nice if the tent had a pocket or two to put items you normally might keep on your bedside table. Also a second door on the other side would be good so you don't have to climb over and wake your partner to go to the bathroom at 4am. Great product. Thanks! If you just realized you have a BB problem.Buy this product IMMEDIATELY.When you start spraying chemicals,these bugs become MUCH more aggressive.If you don't have this bug tent you are going to get EATEN ALL NIGHT LONG! If you already started spraying-PAY for the EXPRESS shipping or you will regret it.These aren't my opinions,they are painful facts that I KNOW!! I paid the extra $10 and got the queen size-REALLY GLAD I DID. I also got the bedlam spray package,WORTH IT. I used all the bedlam and ordered more. I just wanted to let you guys know that I finally got my first night of rest with your tent. woohoo! I really satisfied with this Bed Bug Tent product. I have been doing so many ways trying my best just to get rid of bedbugs in my room. It is rather annoying especially at night during sleep. I did not get good results but when I was introduced to Eco keeper Bed Bug Tent, there was a very noticeable change. Aside from having a good sleep at night, I have no longer seen bedbugs for so long now. Great product indeed! I couldn't sleep while on business trip last week. So I ordered this item for next business trip and shipped in 3 days. Not used so far tho.. no worry at all now ;) Was pretty easy to setup. Thx for good product at affordable price, but if this product had designed more easier to install, it would be really good. Great quality, looks durable to me (: I will keep you posted on how well our experience with this tent goes. As of now, I am quite pleased. Thanks! The tent goes everywhere I travel. It’s easy to set up and really works to keep the bedbugs away. Took this tent with me on my backpacking trip to Europe. You never know where these buggers may be hiding! It comes in a small convenient carrier bag so it was easy to carry around. You know what they say.. better to be safe than sorry! This is a trip necessity! The tent works wonders. How can anyone sleep, myself included, knowing these creatures are feeding on me while I sleep. The tent gave me the ability to sleep without having to worry about getting eaten alive. I know I’m protected inside the tent. Eco-keeper has given my life back to me. I”m a pest control professional and we get about 6-8 bed bug service calls each month. The one product that I make sure my customers have while we treat is the Eco-keeper Bed Bug tent. It just makes sense for me to provided my customers with full protection while we treat their home for bed bugs. Bed bug treatments are usually a three to four time visit treatment program. Nothing works faster than the eco-keeper bed bug tent when it comes to protection against bed bugs. I have a pretty bad infestation according to my pest control guy. Before he came along I actually tried to DIY but every night I was still getting attacked. The first night I set up with the bed bug tent I was bite free the next morning. The streak is at 6 days and running. They couldn’t get to me. Thank you, Tent of all tents. I really appreciate pestmall for recommending this bed bug tent because I was starting to become an insomniac. My kids love it. They think its cool to sleep in the tent every night, and I’m so grateful knowing that my kids are safe from bed bugs. Great product! Ever since I got the bed bug tent I’m not constantly waking up in the middle of the night with a flash light. I can actually sleep peacefully. I have bed bugs, but I don’t have the kind of money to get treatment done by a professional right now. I decided to buy the Eco-Keeper Tent and use that as a temporary solution until I can save enough money to get treatment done. I thought about DIY, but I would feel more comfortable leaving it to the professionals. Excellent product. The reason I ended up buying the tent was because I saw few bed bugs on the celling right above me as I was laying down in bed. I was pretty shocked and angry. They actually thought of a way to bypass all the traps and monitors I set up around my bed, and just climbed up the wall onto the celling. The only move left was to drop down onto the bed for their next meal. I immediately went online and purchased the tent. It’s the only product that can provide full protection. I’m never exposed while I sleep. Great product! The bed bug tent has helped my wife and I get sleep at night without having to worry about getting bit by bed bugs. We’ll sleep in the tent until we get rid of the bed bugs entirely. The Tent is the only thing keeping bed bug off my family at night. I’ll treat the base of the tent with bedlam for added protection, and sleep until morning comes. I can’t thank you enough for keeping my family safe. Great reliable product while in the treatment stage of a bedbug infestation. I couldn’t sleep knowing those creatures had access to me and my family. The tent provides a safe haven for us. The bed bug tent really works, and the proof is in the bite marks, I have none. Its the only thing that isolates me from these blood sucking vampires while I’m getting treatment done from my pest control company. I have two more treatments scheduled so until every last bed bug is gone I’ll be in my tent. Pestmall, Thank you so so much for recommending the Bed bug Tent. I’ve been able to get some solid sleep at night. I’ve also been keeping up with my treatments with the kit I purchased with the tent. Again, thanks for all your help. A. This tent is designed to be an indoor use tent. It does not contain a separate cover to prevent rain water. Would it be safe for me to treat the tent with an insecticide? A. Bedlam would be the only recommended insecticide to treat the base of the tent and any seams and zipper area of the Bed bug tent. What features on the tent keep the bed bugs out? A. Around the base of the bed bug tent, sewed onto the fabric is a 2" vinyl strip serving as a blockade for any farther progress upwards by bed bugs. If, by any chance a bed bugs gets beyond this point and crawls its way up past the vinyl, protection is still assured due to the Non-penetrable bed bug fabric. The mesh that creates the top shell of the tent cannot be penetrated by bed bugs during any stage of its life cycle. Q. bed bug tent outdoor use. Can the tent be used outdoors as an insect barrier for kids? A. The tent was designed for indoor and outdoor use. It's the best form of protection for kids and toddlers indoors and outdoors without the use of chemicals. It will protect against most common insects even no-see-ums and mosquitoes. A. We do not have a company that sells the tent in Saudi Arabia. We can have it shipped to you though. Please email us at info@pestmall.com to request a shipping quotation for the tent. Hi, what's the different between the $89 tent and the $99? How many people can fit inside the $99 tent? Thanks! A. The tents are made in 2 sizes, single and double. Single is made to comfortably fit 1 person. The double is made to comfortably fit 2 people. If you have any further questions or concerns, please feel free to contact us via email or by phone. Q. bed bugs tent size. What is the maximum height for a person to fit inside the tent? A. A person with the height of 6' 6" could comfortably lie down inside with the expandable feature unzipped for more leg room. I'm mainly interested in your Eco-keeper Bed Bug Tents - is it possible for you to send them to Czech rep.? How much does it cost to ship for example 3 single-person tents? Thank you! A. Setting the tent up on top of the bed would not be a problem but securing it on the bed may become a possible issue. What will stabilize the tent onto the mattress so it doesn't slide or fall off? A. Attached beneath the tent are two adjustable straps that wrap around the bottom of the mattress. Once the straps are in place, pull to securely tighten them for stabilization. including Indoor Bed Bug Tent-Bed Bug Proof	insecticides and spray for bug treatments? If you just realized you have a BB problem.Buy this product ..